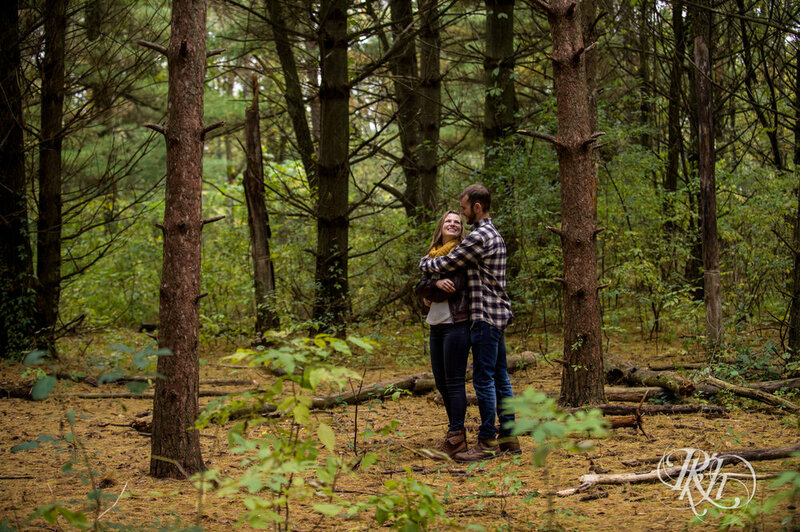 This engagement session turned out so much better than the weather was going to initially allow it to. When this engagement session was booked, we had to do it on a Monday because our weekends were fully booked. That meant that Bri and Wyatt had to take time off work to get their photos done. They booked it a while back too because it was in the fall and people book fall photos a year out at times just to get those colors. Well, come the week before the session and it was supposed to pour down rain the day of the session. The ENTIRE day. And we can work around rain most of the time. It often enhances the greens in photos too if it’s raining. But if it is absolutely pouring hard, it’s tough to deal with. It rained Friday and Saturday that weekend and let up slightly on Sunday, but we already had a bunch of shoots that day. However, we had a client contact us early on Sunday not able to do their shoot. I text Bri immediately and was like, “Are you open at this moment in time today?” Usually people are not able to switch plans at the drop of a hat, but they were able to and we ended up getting their shoot in right before it started raining again. They got awesome shots and didn’t have to take a day off work for rainy photos. Aside from all that, we had no idea this area of Lebanon Hills Regional Park existed. The park is enormous and we had shot there numerous times, but never in this area. Bri showed us where it was and it was so cool because the pine trees make it look like a completely different area than the rest of the park. They were both a lot of fun to work with and we are excited to shoot their wedding this year!